Daniel Sturridge may be the key to Liverpool’s top-four chances, but manager Brendan Rodgers will play it safe with the striker. Forward thinking: Liverpool striker Daniel Sturridge. LIVERPOOL MANAGER Brendan Rodgers is unwilling to rush Daniel Sturridge back into the starting line-up despite the striker’s goalscoring return. The England international made his return from injury on Saturday, coming off the bench to net in his side’s 2-0 victory over West Ham at Anfield. Sturridge’s absence has been a blow for Rodgers’ side, who made a slow start to the campaign and sit seventh in the Premier League. 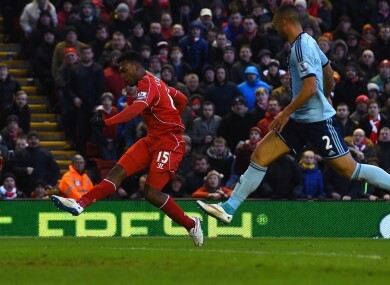 Despite his team chasing a top-four finish, Rodgers said he would play it safe with Sturridge. “He lights up this team. He provides the light,” the Northern Irishman told the British media. ”When you add a top-class player like him to it, you can go to another level. When he came on, the team looked very, very good. Sturridge scored 21 league goals - second only to the departed Luis Suarez - as Liverpool finished runners-up to Manchester City last season. How well do you know Transfer Deadline Day? Email “Sturridge not ready to start, says Brendan Rodgers”. Feedback on “Sturridge not ready to start, says Brendan Rodgers”.